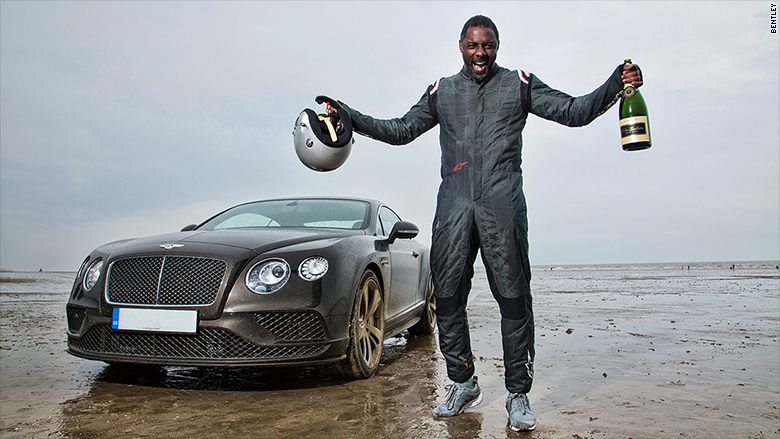 Idris Elba, star actor of the The Wire and Mandela: Long Walk to Freedom, went for a drive Sunday on a beach in Wales. In doing so, he broke a 90-year United Kingdom "flying mile" speed record. In the "flying mile," a car's speed is timed between two points one mile apart from each other. Rather than starting from a dead stop, the driver is allowed to get up to speed before entering the timed zone. The test is run twice within an hour, once each in opposite directions. Driving a Bentley Continental GT Speed, Elba averaged 180.4 miles per hour over the full mile and hit a top speed of 186.4 miles per hour as he shot past the second marker. The two-door Bentley is powered by a 626 horsepower 12 cylinder engine and has a top speed of 206 miles per hour. The car Elba drove was a standard production car and was not modified for the test, according to Bentley. The record run was done for a new Discovery Channel series, Idris Elba: No Limits, which will air in July. The beach on which Elba drove, Pendine Sands in southern Wales, has historically been used for record speed runs. Its tightly packed sands provide a smooth open surface with plenty of space in which to safely reach high speeds. The last flying mile record in the U.K. had been set in 1927 by motor racing journalist Sir Malcolm Campbell who flew past the second marker at 174.2 miles per hour in a specially built Napier-Campbell Blue Bird race car. A few years later, he became the first person to drive a car at over 300 miles per hour, when he drove over the Bonneville Salt Flats in Utah in a 2,500 horsepower car called the Bluebird in 1935.